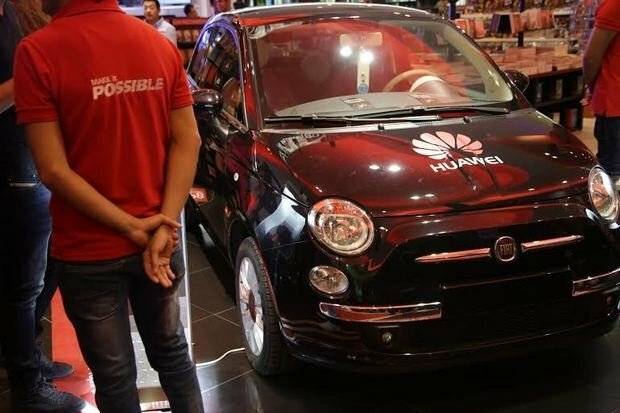 Huawei offered a lucky winner a"Fiat 500 Lounge" in the instant draw that was held during the kickoff party. In a fabulous festive night at Virgin Megastore Stars Center, Huawei Egypt celebrated the first buy of the latest smartphone Huawei P8 with an amazing kickoff party and instant lucky draw for all buyers. The large stock of Huawei P8 was sold out in less than an hour and Lucky winner Verina George was announced instantly to receive the grand prize Fiat 500 Lounge trendy car. Unprecedented crowd gathered at Virgin Mega Store long before the official Happy Hour 9 pm waiting in long queues for the chance to catch Huawei P8 smartphone before stock ends. Meanwhile, the crowd also enjoyed the amazing Laser entertainment live shows which included football free style, electric violin player and drummer show. Huawei P8 smartphone is a perfect blend of technology, sleek styling, usability and revolutionary low light camera features. The Huawei P8 is the culmination of the P series’ rich heritage of style and functionality, and is once again redefining the smartphone market with easy-to-use features that amaze and inspire consumers. Huawei P8 introduces a new philosophy for camera design leveraging a combination of hardware, software and proprietary algorithms to help users capture beautiful photographs, even in the worst lighting conditions.